6 Decor tips for a cozy family room! The long, snowy, winter is right around the corner. As the days get shorter and cooler, families will spend more time inside. It’s time to make your family room a snug place for your family and friends to gather. Read on for six decor tips for a cozy family room. Flooring is one of the most noticeable features of a home. For the homeowner’s enjoyment, the look and style should reflect their taste. However, it is important that the flooring matches the occupant’s lifestyle and budget too. Flooring options each have good and bad points. By carefully evaluating your family’s way of living, you can determine a flooring type that works best for you.Things to consider when choosing flooring for your home include who lives there, how the rooms are used, ease of maintenance, and health issues of the home’s occupants. Open concept living space in home designs has become popular over the past twenty years. 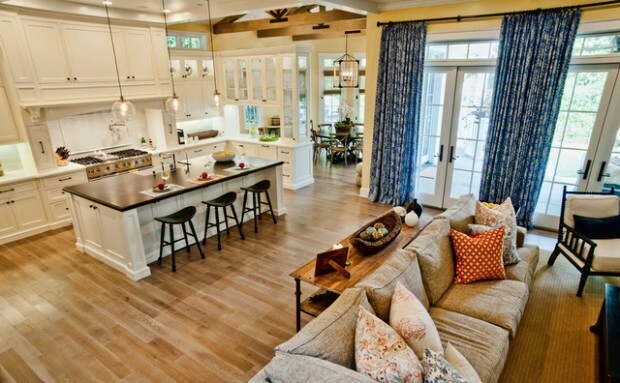 Homeowners like the open floor layout because it encourages family social time and is perfect for entertaining. Parents love the open plan because they can go about their household duties while watching the kids.The lack of interior walls also increases views and natural light and gives a feeling of extra space. Creating an inviting and efficient space in an open layout, however, can be challenging. Below are four interior design ideas for an open concept living space.